VATICAN CITY (CNS) — The church is not a prop for one’s ego, a soapbox for ideas or a suit of armor protecting a sad life, Pope Francis said. “The church exists only as an instrument for communicating God’s merciful plan to the people,” he said in an interview published in the Nov. 18 edition of Avvenire, an Italian Catholic newspaper. God doesn’t ask for grand gestures, just for the trustful abandon of a child in a father’s arms and for sharing that divine love and mercy with others, he said. “Those who discover they are loved very much begin to emerge from terrible solitude, from the separation that leads to hating others and oneself,” he added. While most of the lengthy interview’s questions touched on ecumenism and the meaning of the Year of Mercy, the pope’s responses revealed his vision of the church and the “bad spirit” or psychological defects that foster division. For example, he said, some reactions to his apostolic exhortation, “Amoris Laetitia,” continue to reflect a lack of understanding about how the Holy Spirit has been working in the church since the Second Vatican Council. Historians, however, say it takes a century for a council’s teachings to fully sink in, which means “we are at the halfway mark,” Pope Francis said. The church and its members are asked to be docile to the Holy Spirit, he said, and to let the Spirit do the work because the Spirit knows when “the time is ripe” for things. Calling the Year of Mercy was an example of that, he said. It was not “a plan” of his own, but something inspired by the Spirit and built on the cornerstones of his predecessors. “The cancer in the church is giving glory to one another,” he said in response to an observation made by Orthodox Ecumenical Patriarch Bartholomew of Constantinople, who said a worldly mentality within the church was at the root of divisions among Christians. Someone who has never heard of or encountered Christ can always come to know him someday, Pope Francis said. There is a “sinful habit of the church to look too much at itself as if it believed it had its own light” — what Bartholomew called an “ecclesial introversion,” the pope said. Divisions are born when the church looks too much too itself and not to the real light of Christ, which the church reflects like the moon does sunlight. “Looking at Christ frees us from this habit and also from the temptation of triumphalism and rigidity,” the pope said. The guide for knowing the right path to take is always understanding the importance of following the Holy Spirit, he said when asked about criticisms that his outreach to other Christian communities was a sign of “selling out” Catholic doctrine or “Protestant-izing” the church. He said he doesn’t “lose sleep” over such critiques because it’s important to see what kind of “spirit” is motivating such opinions. “When there is no bad spirit” behind the remarks, differing opinions can be helpful for walking the way of the Lord, he said. As long as the church and its members keep their focus on Christ, they will avoid many of these errors and temptations, he said. It is walking behind Christ and doing his will by praying together, helping the needy and dying as martyrs together that will unite all Christians who already share the same baptism. Ecumenism is a process, a walking together, not carving out or “occupying spaces,” or setting aside and ignoring theological differences, he said. The “grave sin” of proselytism, too, goes against the “dynamic” of authentically becoming and being Christian. 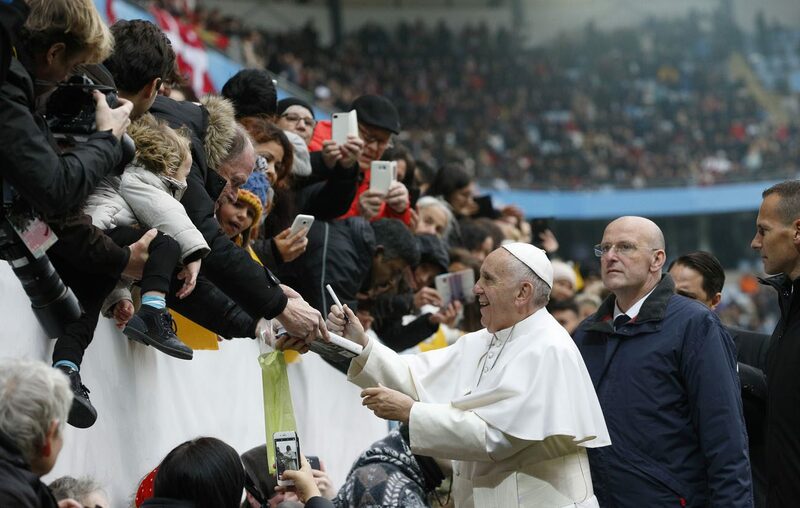 “The church is not a soccer team seeking fans,” he said.